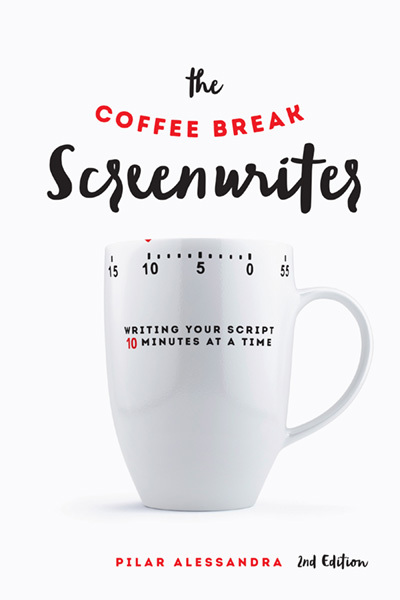 The concept of the book The Coffee Break Screenwriter, by Pilar Alessandra, is brilliant. What can you do in ten minutes to advance your screenplay? Most of people writing screenplays don’t do just that: they may have another day job, a family to take care of, including children, other activities they are involved in, etc. And they can’t dedicate big chunks of time to their writing. Pilar Alessandra has divided the whole workflow of writing a screenplay in chunks of 10 minutes. That includes crafting the story, building its structure, writing the outline, working on the characters, finishing the first draft, working on the dialogue, doing the rewrites, producing the final edit, and presenting the work to the industry, all that 10-minutes at a time! And through all these 10 minutes chunks of time, all the various aspects of writing a screenplay are addressed in a very clear, straightforward, and efficient way. The main addition of this second edition is the place that is made to writing for TV. This is due to the late development of TV Series as an art form and as a place where writers make most of their money today. All the process Pilar Alessandra developed for writing a screenplay 10 minutes at a time is also applied to writing TV Series. Another advantage of working on your screenplay 10 minutes at a time is the fact that it forces you to be really focused on the task at hand and therefore to do it more efficiently. On the long term, you will therefore spend less time working on your script. This book is a must-read for any screenwriter who really wants to get involved in the business and doesn’t necessarily have a lot of time to invest in it yet. But working screenwriters will also find a lot of useful information about the craft and a straightforward workflow that will help them improve their efficiency.